NORTH VANCOUVER, B.C. The trend towards multi-family living in Metro Vancouver is driving innovation in design. 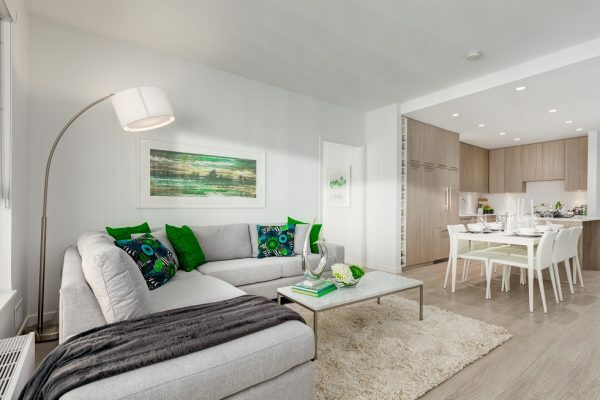 Green on Queensbury by Qualex-Landmark™, a $100 million condominium and townhouse project in the soon to be revitalized Moodyville neighborhood, has revealed its designs for architecture and interior designs. As the first fully park-side development in Moodyville, Green on Queensbury award-winning designers’ GBL Architects Inc., Cristina Oberti Interior Design Inc., and PFS Studio landscape architects have produced designs to appeal to young families, young professionals and empty nesters to maximize the advantages of living on Moodyville Park. The design is especially appealing to those seeking an outstanding living space with direct access to the park and the North Shore Spirit Trail. According to Statistics Canada’s 2016 Census, released in Spring of 2017, fewer Canadians are occupying single detached homes and the demand for multi-family homes is on the rise. The rise of multi-family homes is especially prominent in Vancouver which now has the third largest share of multi-family homes at 58 per cent while single-family homes only account for 29 per cent. GBL Architects Inc., the firm behind Green’s architectural design, is an award winning Vancouver based firm with a 25 year reputation of providing a full range of architectural services to the private and public sector. The firm has built its reputation on high quality design and most recently won two awards at the 2016 BUILD-News Architectural Awards, one of which was Most Innovative Architectural Firm 2016 – Vancouver. Targeting “LEED Gold for Homes Multi-Family Midrise” standard, the $100 million four-story building will consist of three buildings and a total of 164 one, two and three bedroom homes. The buildings’ latest designs have benefitted from input from the City of North Vancouver planning department, the public and two advisory panels. Each building has been designed and sited independently according to its context. The centre building is slightly more formal. It features a pitched roof and strong corners, reminiscent of a more historical building form. It is well set back from the street to establish a green forecourt off East 3rd Street. The East and West buildings are more casual. In consideration for Moodyville Park outlook to the East and Moody Ave to the West, the buildings are asymmetrical and staggered in form. They also feature flat roofs, corner balconies, and transparent lobbies. 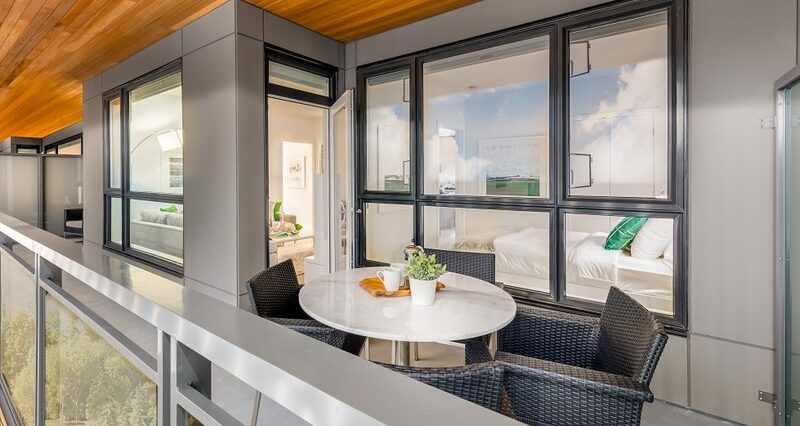 All three buildings offer grade level garden homes and park-fronting townhome entrances that connect naturally and seamlessly through private patios to Moodyville Park. Green has been designed in conjunction with Moodyville Area Development Permit Guidelines which state that it must contribute to the identity of Moodyville, create neighbourly streetscapes, advance sustainability, improve mobility and promote housing diversity. The innovative open concept interiors are designed and finished by Cristina Oberti, principal, Cristina Oberti Interior Design Inc. to reflect everyday elegance. Oberti is an award winning, Vancouver based, interior designer, her firm has been designing projects throughout Western Canada and recently the United States since 2000. Most recent awards include the 2015 Gold Nugget of Merit and the 2015 award for Best on the Boards. The wood-laminate panelled cabinetry brings a homey, almost vintage aesthetic to the space, while the modern fixtures give it a contemporary edge. Key materials such as quartz stone countertops and backsplash in the kitchen and beautiful porcelain marble-style tile surrounds in the bathroom provide the perfect neutral backdrop and sophisticated punch that brings the space to life. Photo caption: The panelled cabinetry brings a homey, almost vintage aesthetic to the space, while the modern fixtures give it a contemporary edge. The breathtaking landscape design and concept for Moodyville Park has been designed by the very talented and renowned landscape architects of PFS Studio. As a leading Canadian planning, urban design and landscape architecture firm, PFS Studio has been in practice for over 30 years. PFS was won numerous awards including American Architecture Prize for “2017 Firm of the Year” in the category of Landscape Architecture & Urban Design. “Inspired by historic Moodyville, the milltown industrial vernacular informs the landscape design vocabulary. A water feature will recollect the water flumes which crossed the site over a hundred years ago, transporting logs to the Moodyville sawmill” says, Mike Derksen, landscape architect, PFS Studio. Green will have an indoor amenity space between buildings A and B with a break-out space facing the park, and an exterior amenity space between Buildings B and C with a sound-baffling water feature. Building C is set back to accommodate a park entry plaza, which will continue the Queensway Greenway, and introduce and direct users to the park. This area is also identified as a Public Art opportunity, to be explored in detail through the public arts process. One of Green’s distinguishing features is its versatility. It’s designed to cater to the sophisticated tastes of young professionals, young families and downsizers. It provides all the comforts you want in a home with the all the luxuries of a high-end spa or hotel.